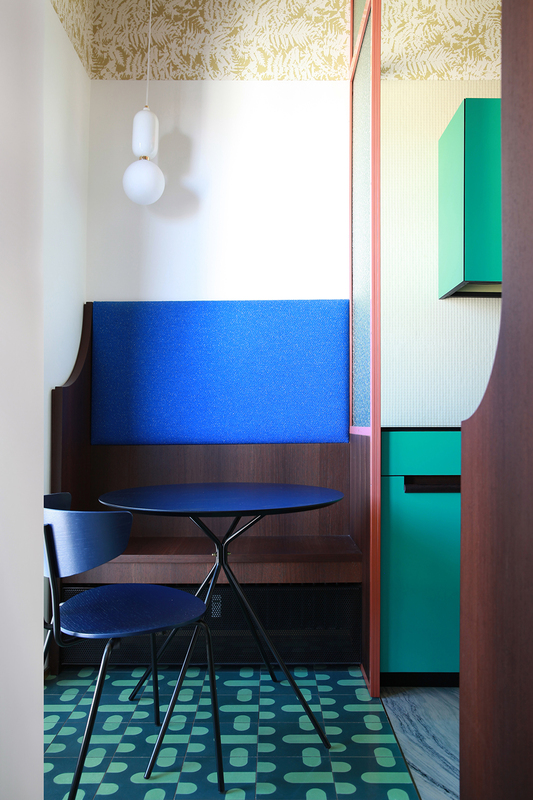 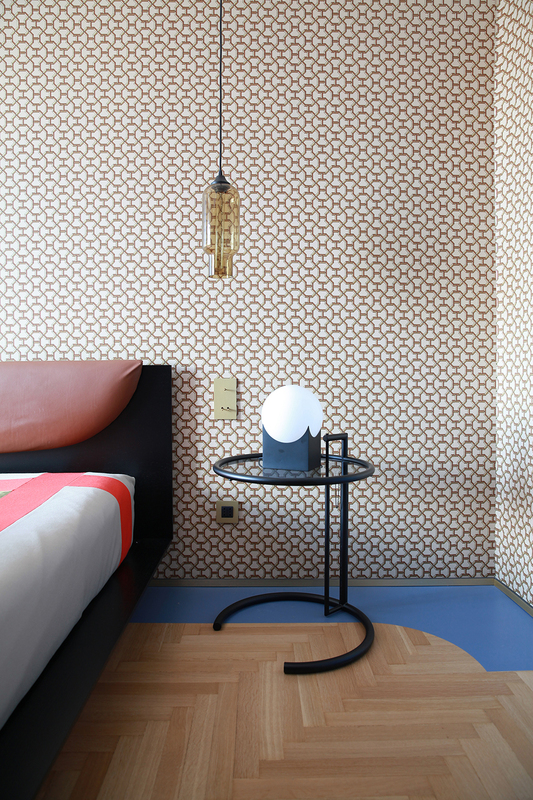 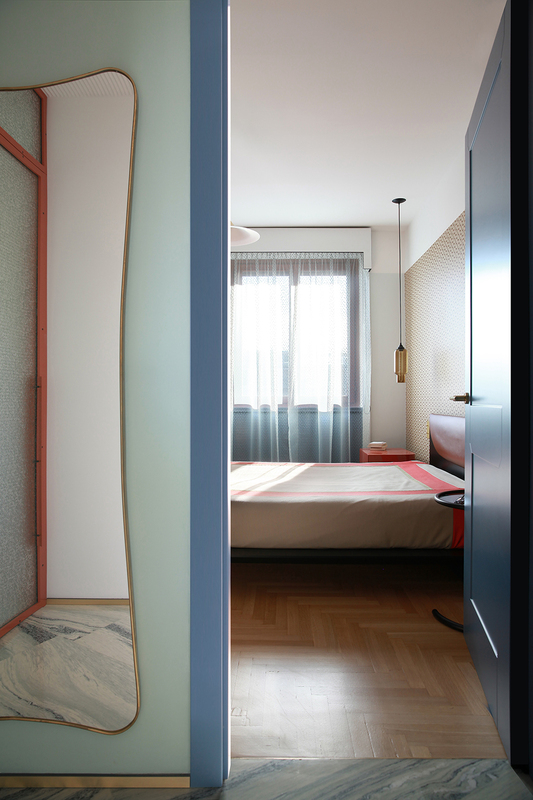 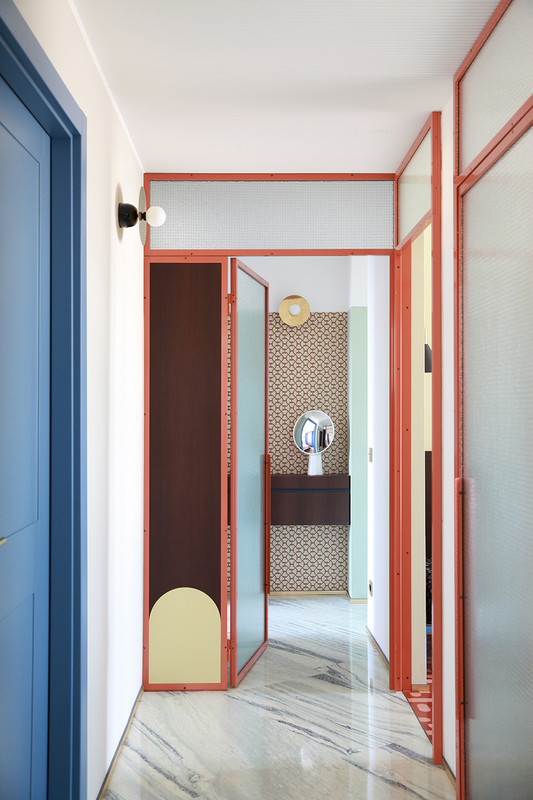 For this apartment, set within a building from the late 1960 on Corso Sempione, the Turin-based duo has applied its immediately recognizable style to reinterpret a typical bourgeois Milanese home in a highly original way. 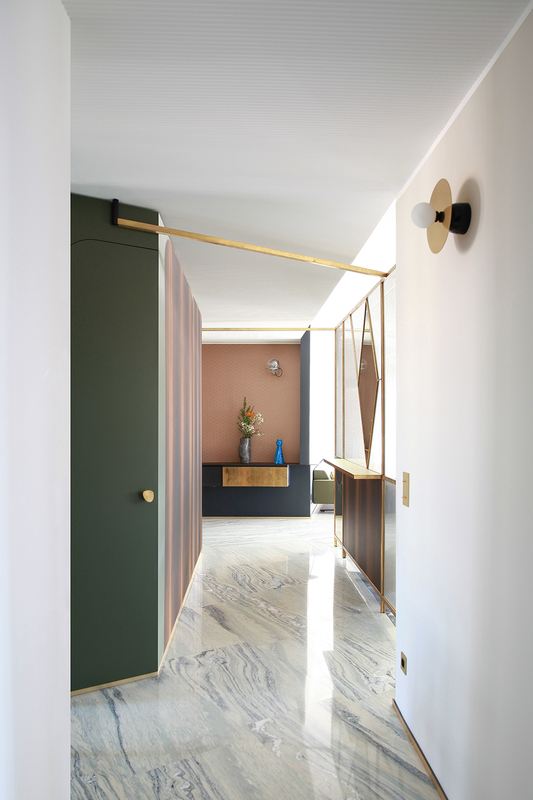 Keeping a classic layout, with a central corridor providing access to the various rooms, the design expands the living area and connects it to the entrance, while maintaining visual contact with the kitchen. 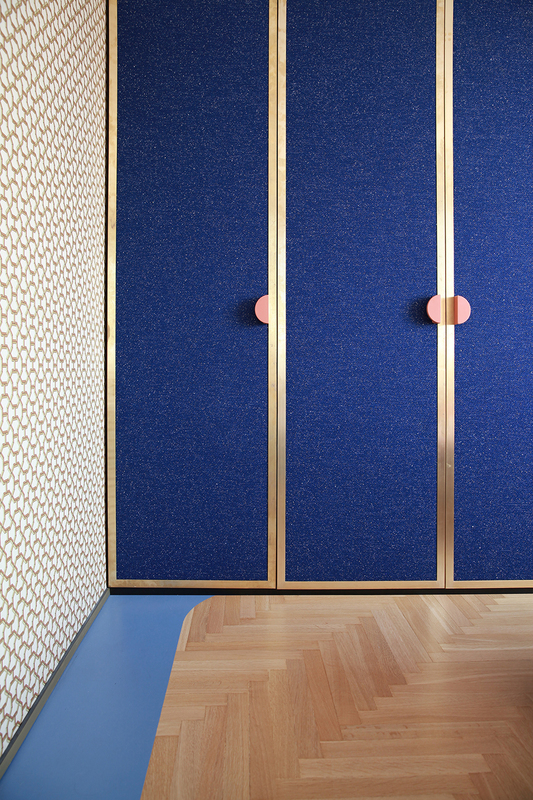 Through doing so, something unexpected happens: the space is unified and, somewhat surprisingly, extended outwards, yet at the same time it is still subdivided into perceptible functional areas. 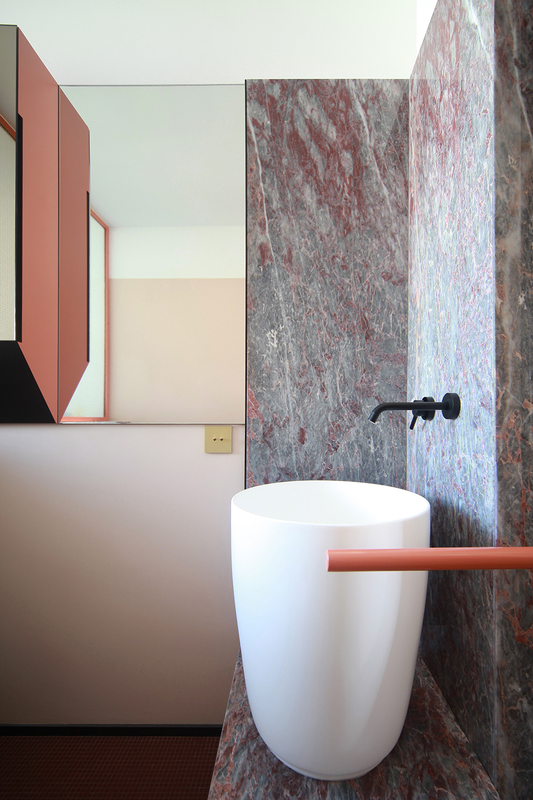 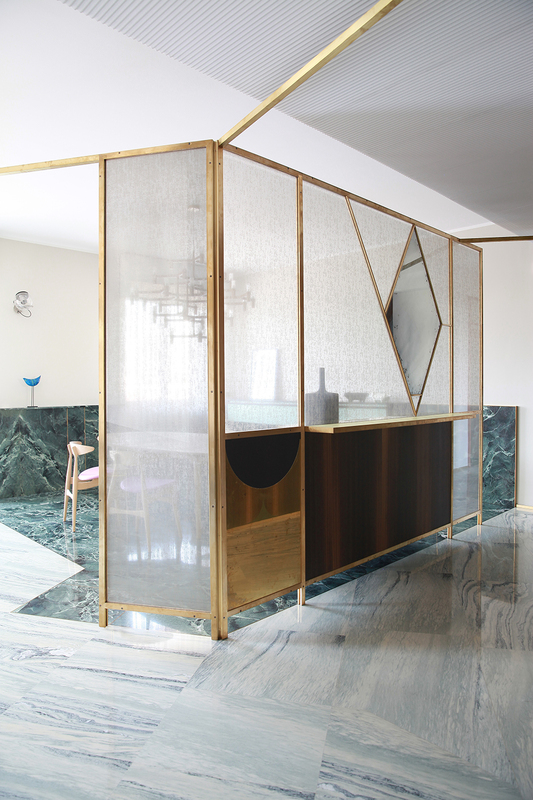 Through the use of marble (supplied and installed by the historic Catella firm, which Gio Ponti mentions in the book “Amate l’architettura”), the design flows from interior to exterior, and from one area to the next. 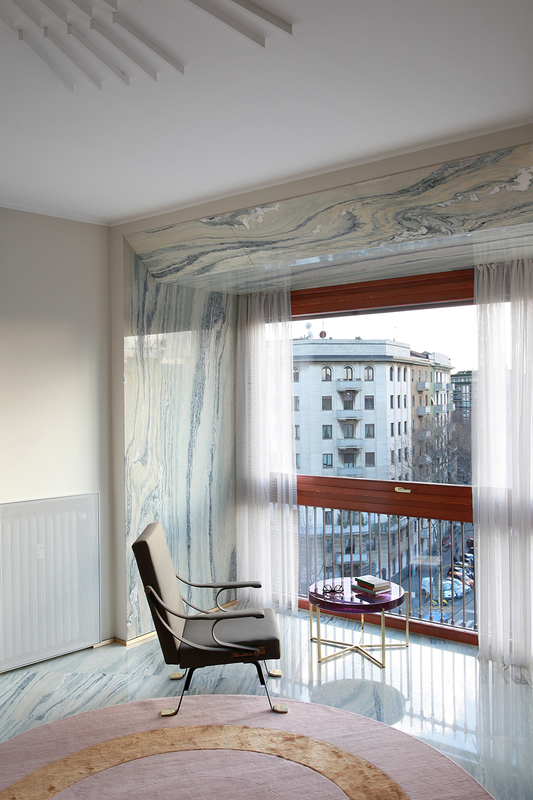 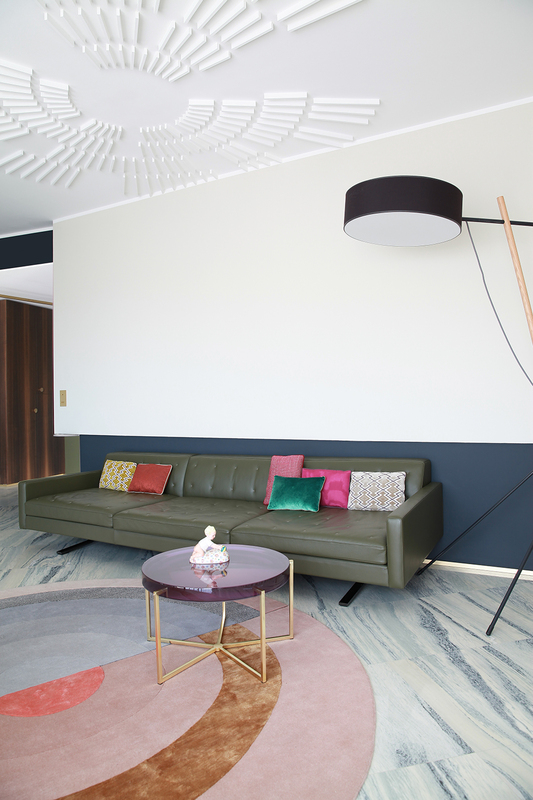 The floor in “Cipollino Tirreno” marble extends from the entrance hall to the living room, even being used on the walls and “closing” at the ceiling to frame a view of Milan that appears almost like a meditative landscape. 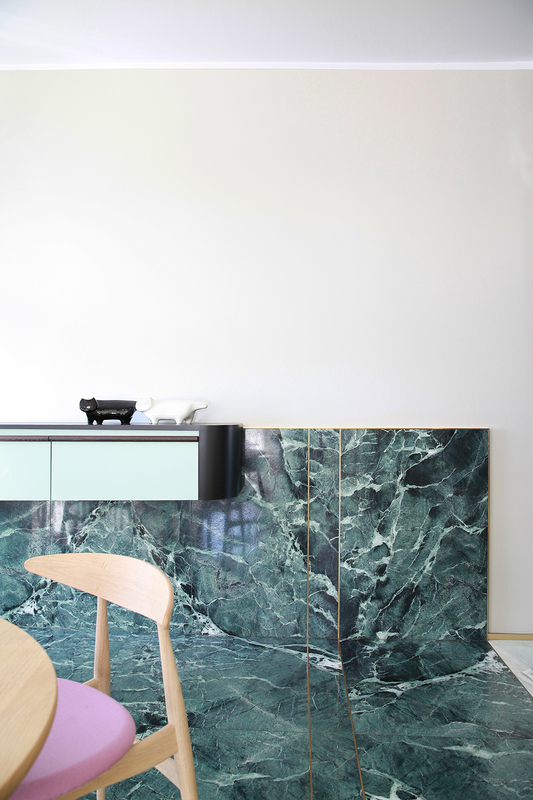 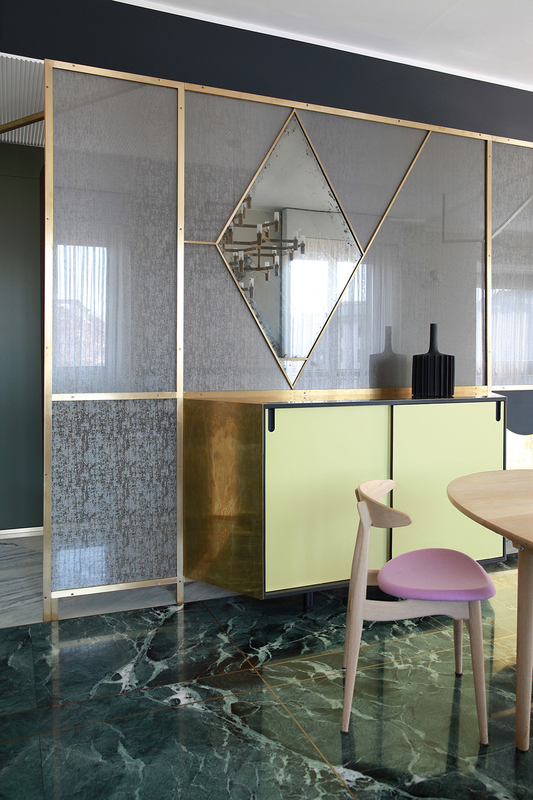 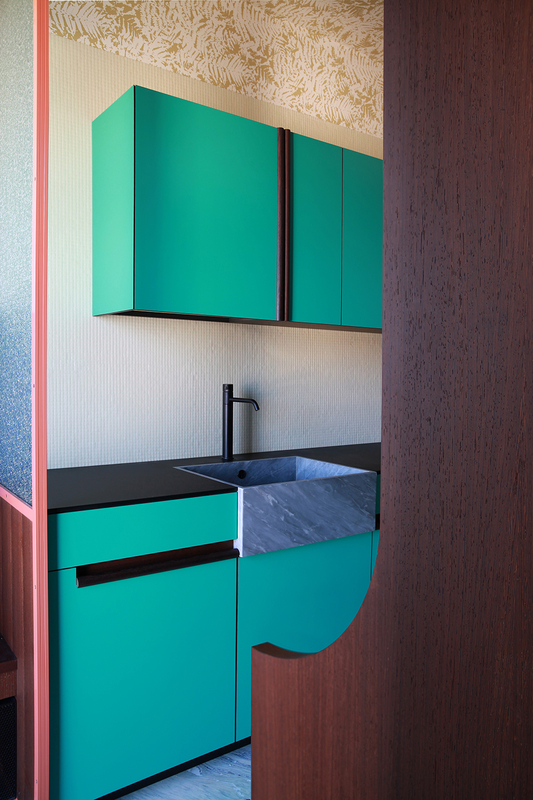 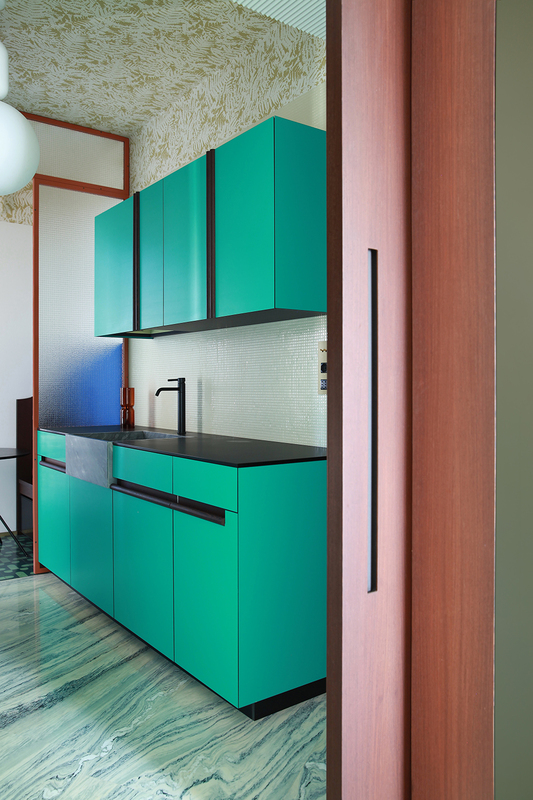 Moving towards the dining room, this material gives way to “Verde Alpi” marble, which becomes a “carpet” on the floor for the dining table, a wallcovering, and even furniture itself in the form of a shelf on which to place objects. 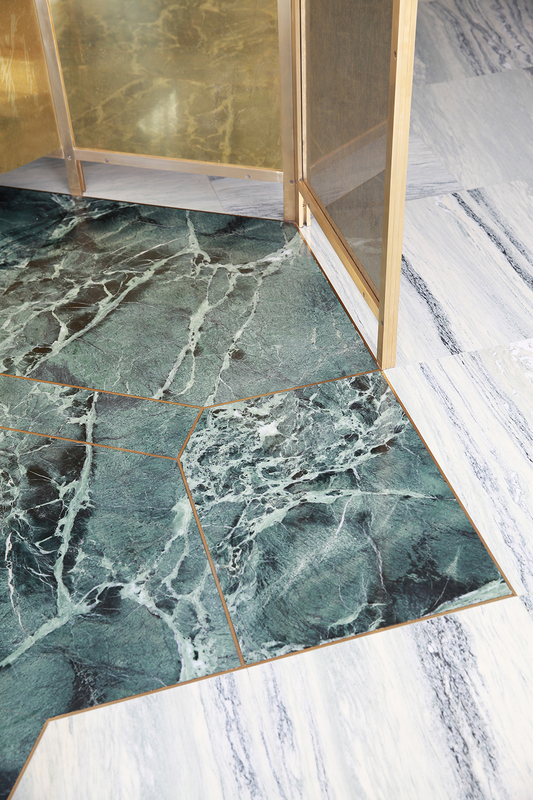 The design of the marble slabs and the pattern of the veins within them create visual pathways, guiding the inhabitants through a pattern of precise spatial hierarchies. 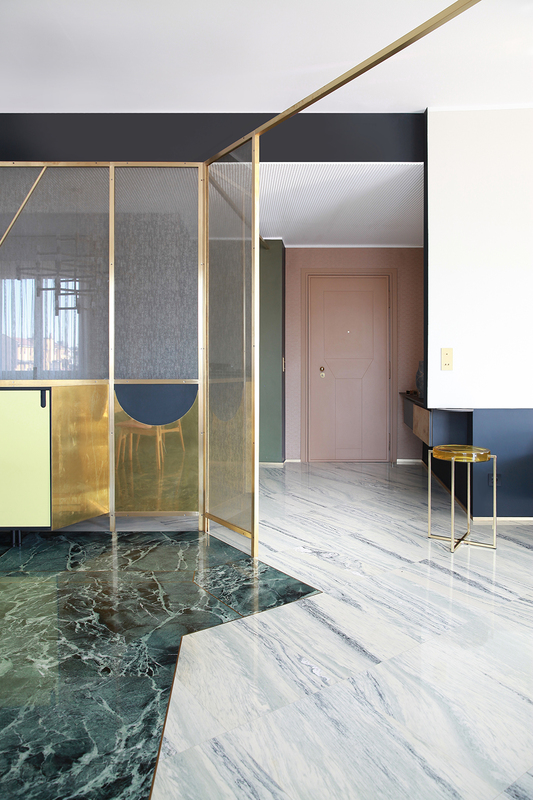 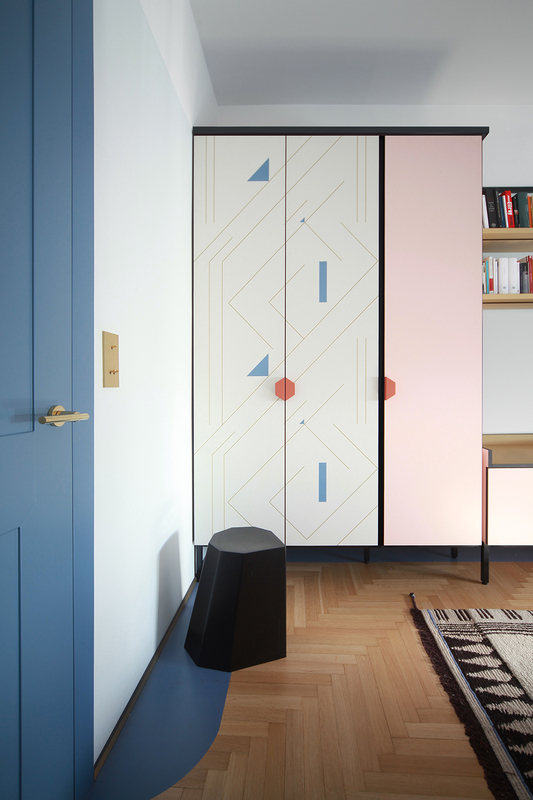 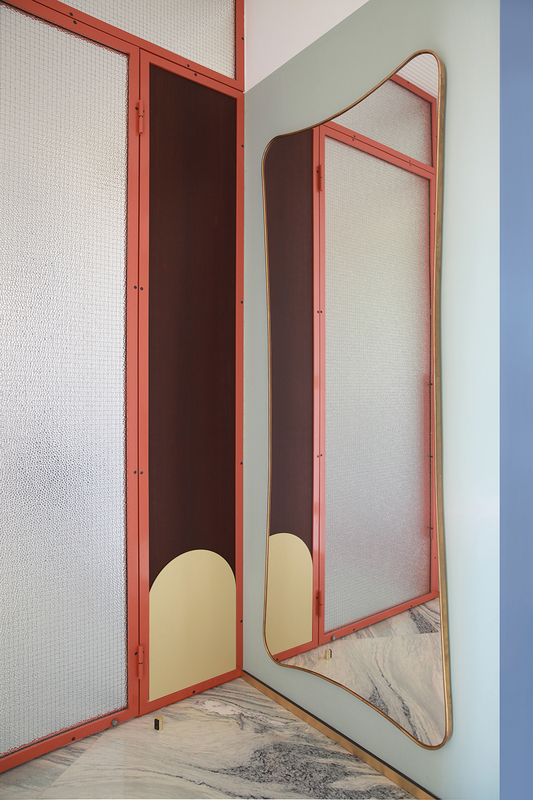 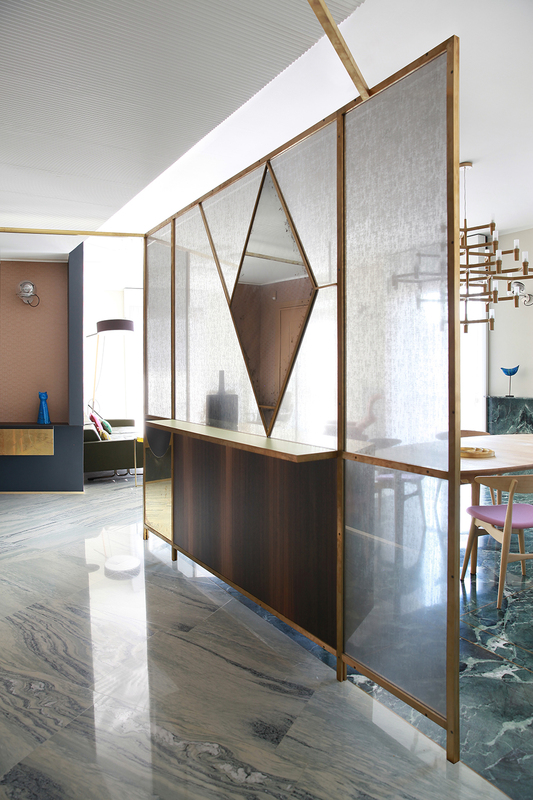 The floor joints also form the base for a screen in brass and glass, another custom-made piece, which acts both as a visual filter between the entrance and the dining area and also as a storage feature, and whose metal “arms” indicate more intimate visual pathways between the apartment’s entrance, the kitchen and the living area. 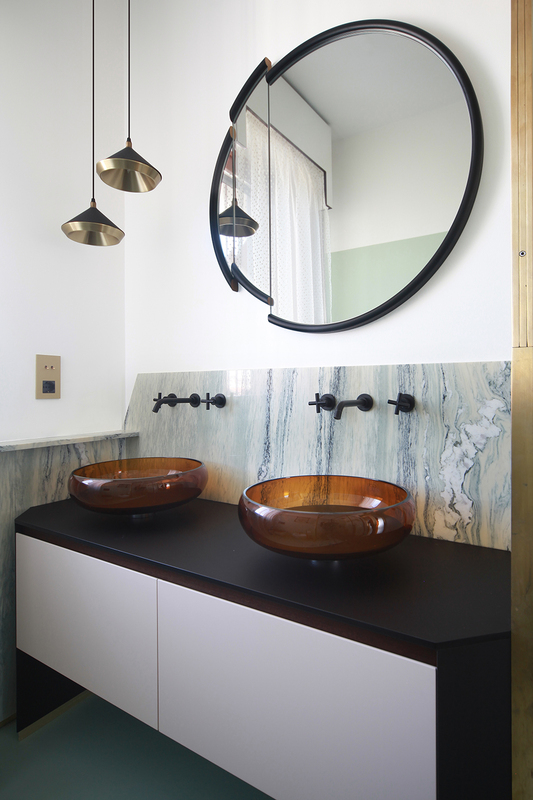 The use of marble continues in the corridor and the bathrooms, again covering the walls to provide a luxurious backdrop and base for the washbasins, in grey “Salomè” marble. 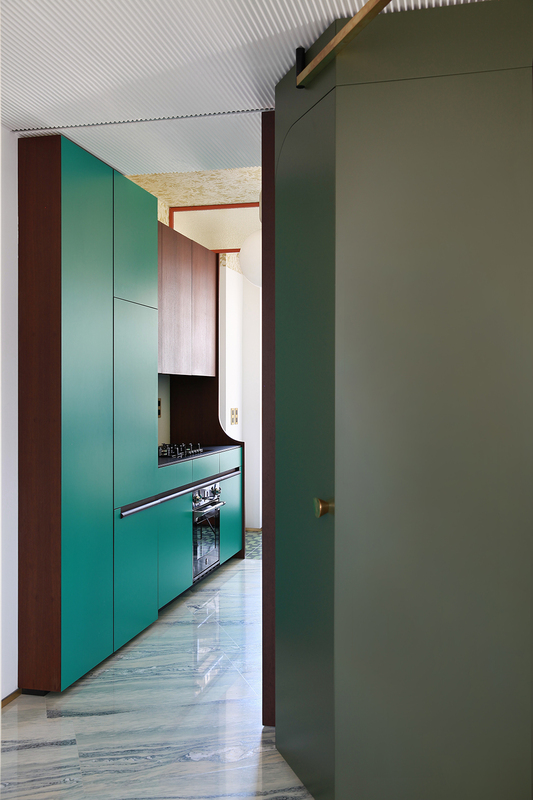 The cement tiles, the original wood floors updated with resin coatings, the colored metal structures for the doors in wire mesh glass, along with the materials used for the custom furnishings (laminate in the kitchen, the bath furnishings and the storage cabinets) reference the period in which the building was first constructed. 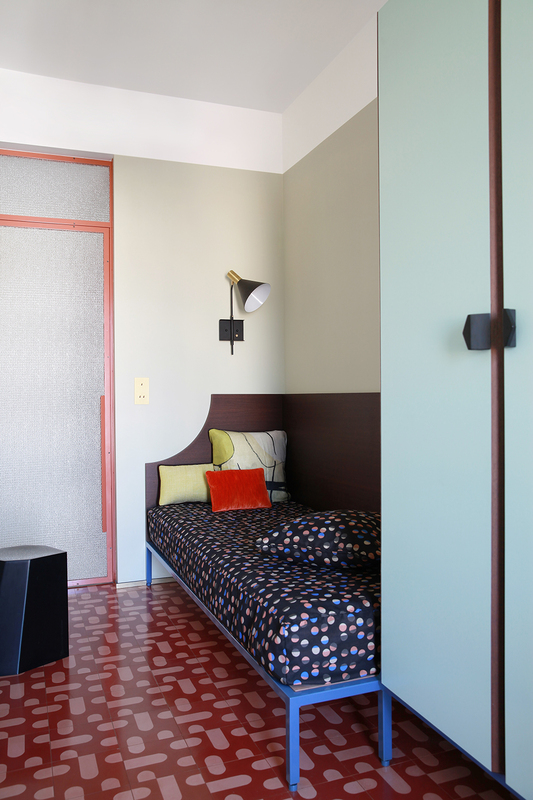 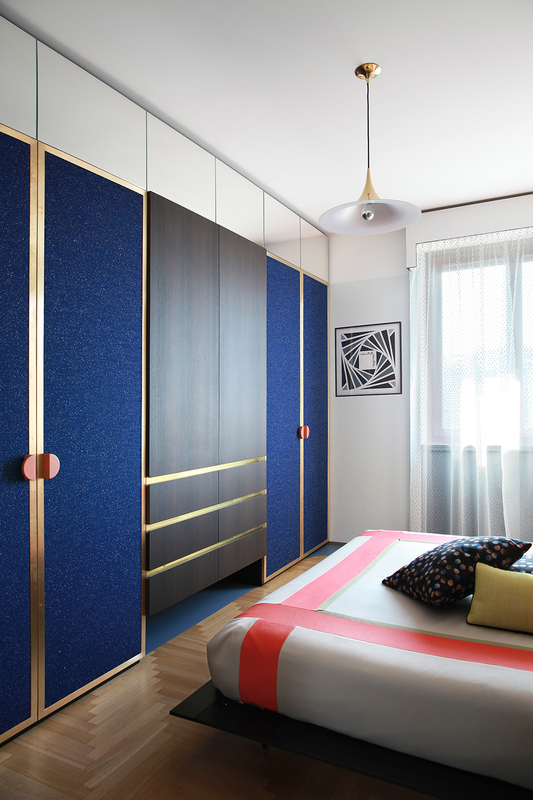 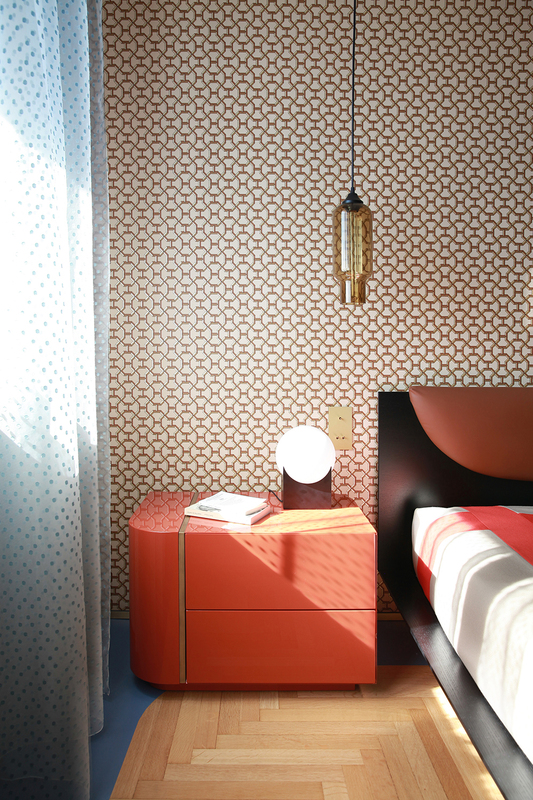 They also “dampen” the high notes of more precious materials, such as the brass, marble, and the wallpapers and the fabrics of the wardrobe doors in the master bedroom. 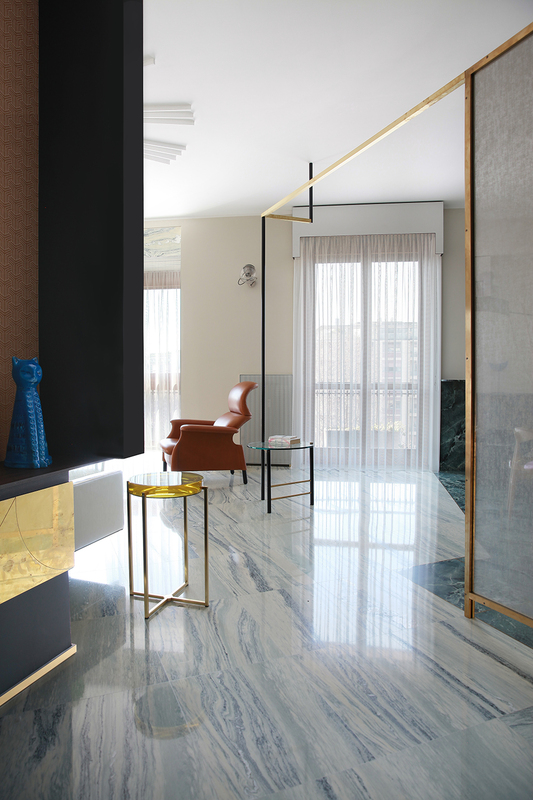 In this way, the interaction of materials, forms, colours and surfaces, as manipulated by the designers, is transformed and creates unexpected emotional reactions in the viewer linking the contrasting styles of everyday and sophisticated, high and low, past and contemporary. 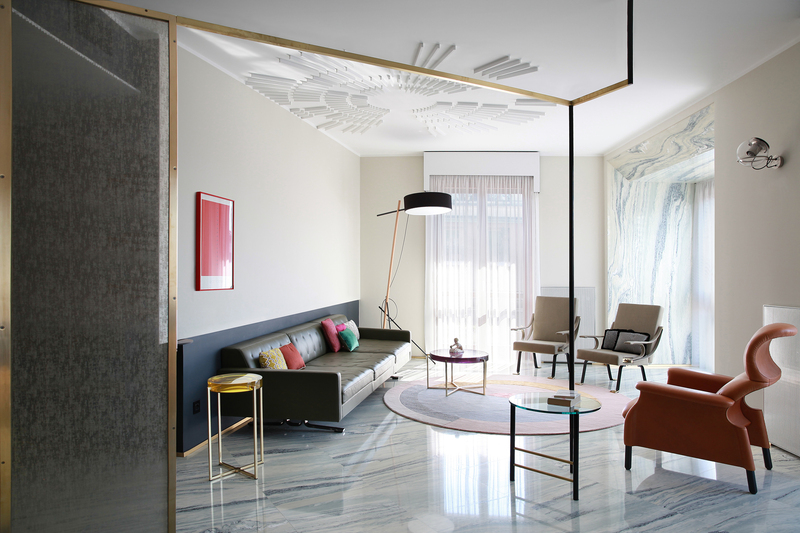 This is a project that has taken its cue from the architecture of the space, the light, the exterior, just as in the finest tradition of the Milanese architecture of the 1900s. 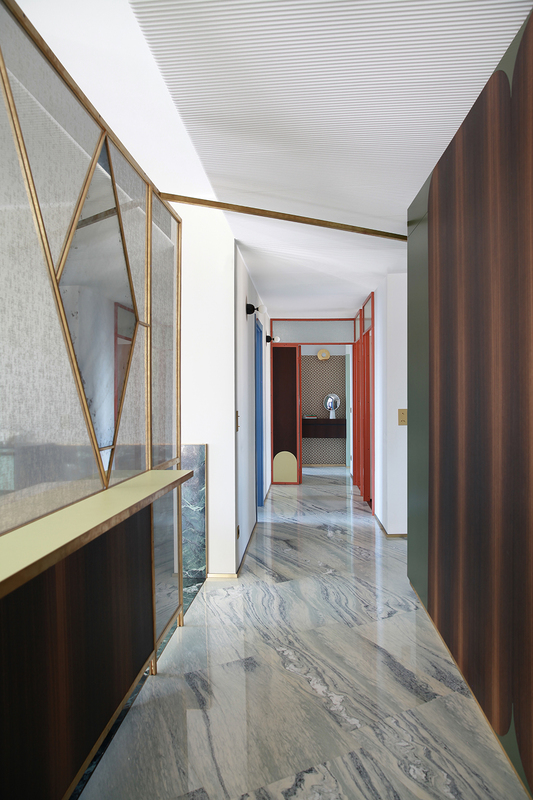 But in this case decoration has also become an integral part of, and in fact, an extension of the architecture itself. 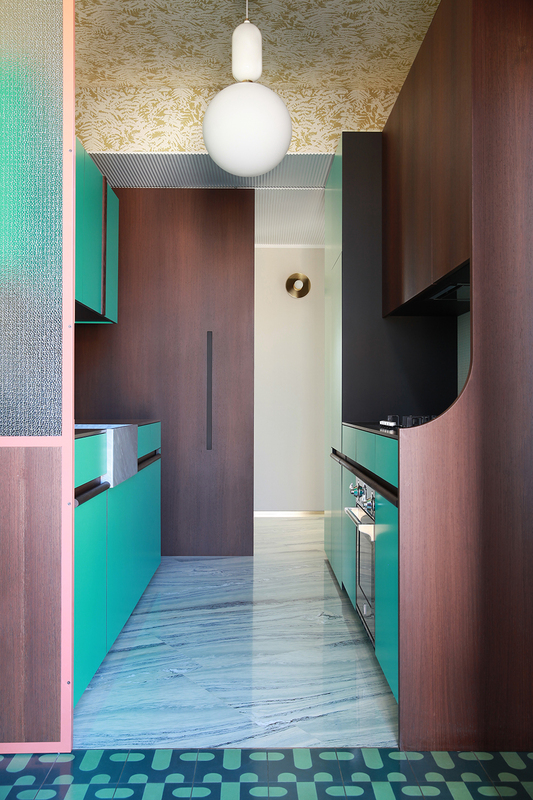 In this way, the project itinerary of Andrea Marcante and Adelaide Testa extends from floor level and even grants expression to the ceiling where, as the Jungian psychoanalyst James Hillman asserted, “the gods no longer live.” For example, the design of the large circular ceiling rose aims to restore dignity and symbolic value to a part of the building that according to Hillman – and the architects themselves – is now the most neglected in the field of interior design. 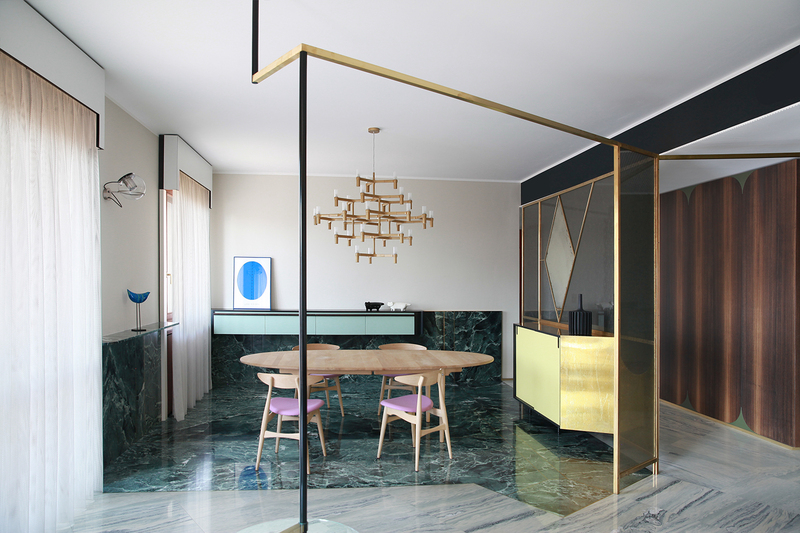 As in many of the best projects of Vico Magistretti, the furniture within the apartment features a combination of 20th-century and contemporary pieces, which are used to create refined living spaces that reconcile modernity with tradition, but, also, in this apartment, they display a sense of irony – the ability to never take themselves too seriously – which is typical of the work of Marcante-Testa.